As promised I thought I will make at least one post every month. So today it is Rasam, one most favorite recipe in Tamil household. Easy to make. Salt — according to taste. Cumin Seeds/Jeera – 1 teaspoon. In a pan dry roast toor daal, corriander , black pepper, cumin seeds separately and allow it to cool. Chop tomato, and garlic. Add the above roasted items aling with this and grind it to smooth paste. Heat oil in a pan, once hot add items in to temper. If adding onion saute well, add the ground paste. mix well and then add tamarind water and salt. Check if froth starts coming up. If so stop cooking. Add cilantro leaves and garnish. Serve with rice. It has been more than a year that I wrote something in this blog, thought I would post something for 2017. Life has been really busy and have not been able to keep up. A lot of changes have happened over this year. I have moved to instant pot from normal Indian pressure cooker and have been loving it so much that I totally forgot normal pressure cooker and started using only instant pot. My terms of eating healthy have changed too. I learnt that I have been taking more of carbs than protein. Protein is something very important for us. And carbs in moderation is needed to our body. White rice is not completely bad, in case it is paired up with proper protein. Be it white rice or brown rice, the carb level is same, except brown has more fiber, same goes with wheat flour or normal flour. One major reason is this learning I had about food, I am trying to change myself to a proper diet. So this is one post, I am writing here. I may not continue more, if time permits, I promise to do at least one post a month. 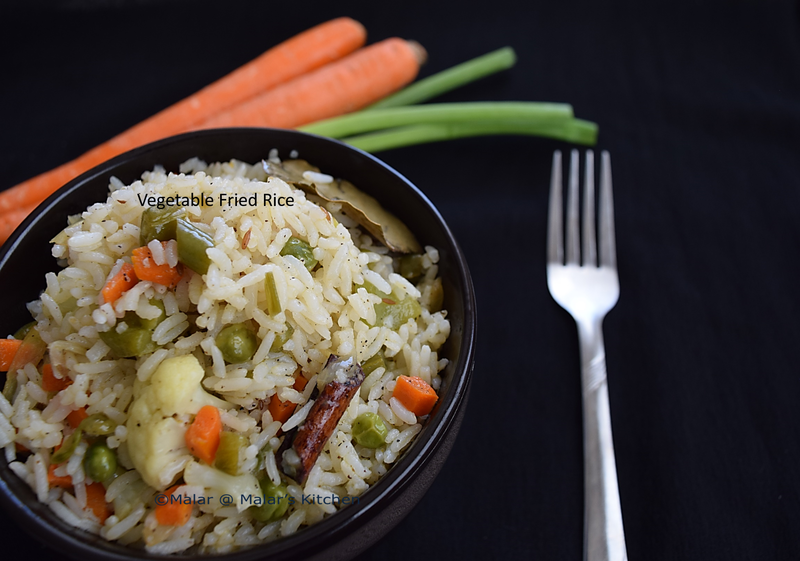 Simple biriyani, the recipe goes below. Have instant pot in saute mode, add ghee or oil. Meanwhile soak rice in water. Once hot add items in to season. Next add onions and saute for 2 minutes, add ginger garlic paste. Next add potato saute for a minute. Next add carrot and green beans saute for 2 minutes. Add edamame, peas and saute for another 2 minutes. Next add cilantro leaves, mint leaves, tomato, give it a good mix. Add chili powder, corriander powder, biriyani masala nad give a good stir. Next finally add cauliflower and drained rice. Give a good mix. Stop saute mode in IP. Add water and salt. Close IP and put it in sealing. You can do rice mode or Manual 5 minutes. Let it NPR in manual mode. With Rice mode I would wait for 5 minutes after it is done and NPR. Finally mix the sauteed Tofu or Paneer which gives more protein. Been really long, absolutely no time to check my blog. Have been thinking of posting, ain’t got time to write down a post. Have some pictures taken and been there in the memory card. Little one is growing fast and I am going around her where ever she crawls. This gets the mommy tired 🙂 Anyways lets get to this recipe. This is a recipe from my dear friend PM’s mom. When she told me that is she going to make this thugayal, I got fascinated and loved the recipe. I wanted to try immediately and absolutely loved the taste. This recipe is one of the treasured recipes from her mom. Here it goes, remove the banana flowers and when you get to the stage you can remove anymore, just cut it in half. Use the petals which are soft. Discard those which has more fiber and can’t cut. Throw the banana flower and the petals in a pressure cooker, add salt, tamarind and some water and cook for 3 whistles. In a small pan, heat some oil, add urad dal, red chili, hing. Once it cracks, let it cool. Take out the pressure cooked flower, petals, add the above and grind it to a fine paste. Next heat the remaining oil, add mustard seeds and curry leaves. Add garlic once they start to brown, add the paste and mix well. Cook in low flame until it thickens. My friend told me that , they prepare it for ladies who delivered babies. This helps cure the internal injury in new moms. As you know Banana flower is full of iron content. Though it is a little long process, it is absolutely worth it. This tastes so good. Do give it a try. You can store it for a week as we have loads of oil. Use it as thokku. 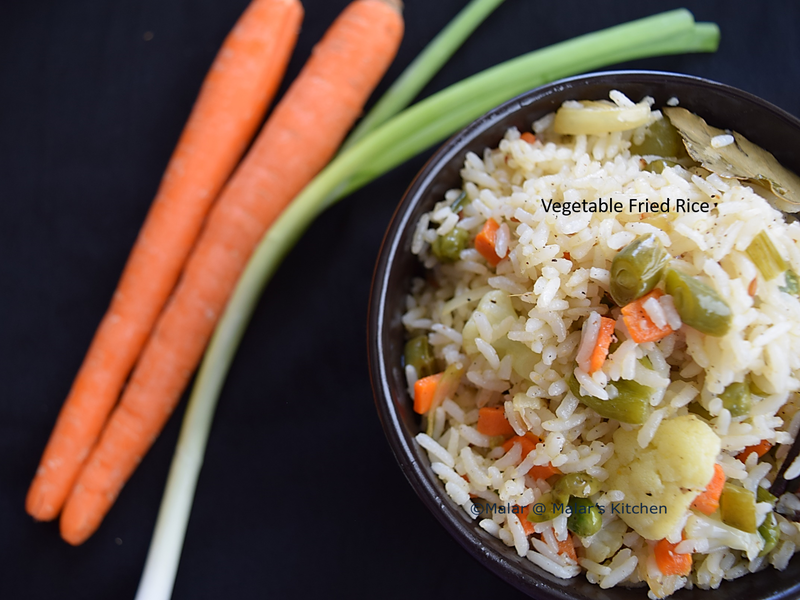 When I get loads of veggies, on Sunday I opt for vegetable fried rice. My hubby would not want to use soy sauce. So here is a very interesting version with the usage of vinegar. It tastes awesome. My hubby gave me this recipe. We both love it. Hope you will also enjoy this. Chop all the vegetables to small pieces. Heat oil in a large pan. When hot add cinnamon sticks, bay leaf, cloves, cumin seeds. When they crackle, add onion, saute for 2 mins. Next add carrot, beans and saute for 2 to 3 mins. Add bell pepper now, saute for another 2 mins. Finally add cauliflower, frozen peas saute it. Mix black pepper powder, salt. Now add vinegar and mix. Let all the veggies cook. Finally add the spring onions cook for 2 mins. Once all the veggies are cooked. Reduce the heat to low. Once all the veggies and rice gets mixed, check for salt. If needed add more and mix. Serve hot 🙂 I like it simple raita, you can also make gobi manchurian. Hope you all had a wonderful Diwali. I just made some millet poha ladoo , murukku, gulab jamun. On Diwali day, managed to make some Masala Cheeyam as well. For gulab jamun I used the instant pack. I had some sugar syrup left out . Its was flavorsome as I had added some saffron, cardamom, vanilla extract. Usually everyone adds rose essence, I didn’t have it, so I used vanilla extract. I somehow didn’t want to throw that syrup. Decided to make sweet diamond cuts with it. It came out awesome. A great tea time snack. I have made it with whole wheat flour. Again traditionally it is made with all purpose flour/maida and semolina/sooji. I have not given any measurement as I didn’t use any. You can play around with the sweetness and the amount of flour. Also I have not used oil while making dough, as the gulab jamun would leave out oil in the syrup. Combine flour, sugar syrup, salt and mix well. Form a dough if needed add some water and make a firm dough. It should not be loose and should be a thick one. Roll out with rolling pin and cut in to small diamond shaped pieces. While rolling out as we are deep frying, make it medium sized not too thick nor thin. When hot, slowly drop pieces in and let it fry. Have the heat in low medium. Once done, remove and drain excess oil in a paper towel. Enjoy with a hot cup of chai or coffee. For baked and savory version, here is the link Baked Wheat Crackers. Happy Diwali everyone 🙂 This year being the first year for my daughter, it is quiet special. But these days I am rarely getting time. Preparing day to day food with her is getting challenging.Even if I prepare something taking picture is time consuming 🙂 So I made this quick laddo. I try to include millet in my diet as they are rich in iron. This is a basic poha laddo, with the addition of millet. Dry roast little millet/samo, poha, dalia and grind it to a fine powder. If you are using sugar grind it to a fine powder as well. I used jaggery, so I made a syrup and heated it. Heat ghee in another pan, roast cashews. Add ghee, jaggery syrup to the powder and mix. Heat milk and mix with the above. Form round balls when hot. If needed add more ghee. As we are adding milk, this needs to be refrigerated. Stays good for a week. 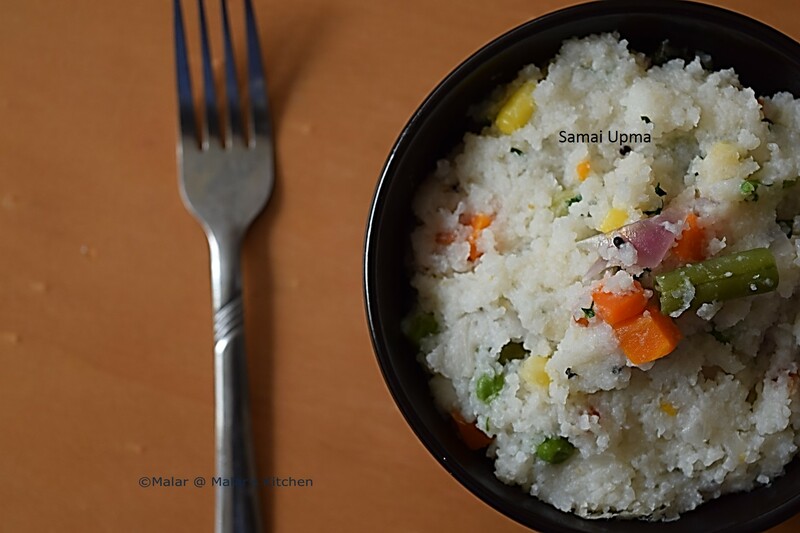 Do check out some more Diwali recipes, Rice Kodubale, Sweet Somas/Gujia. This is a very long pending post from me. I have given this guest post to Usha of “Maha’s Lovely Home” long back. When I was planning to post it in my blog, I had to go to labor. After that I couldn’t get time to post. So here it is. 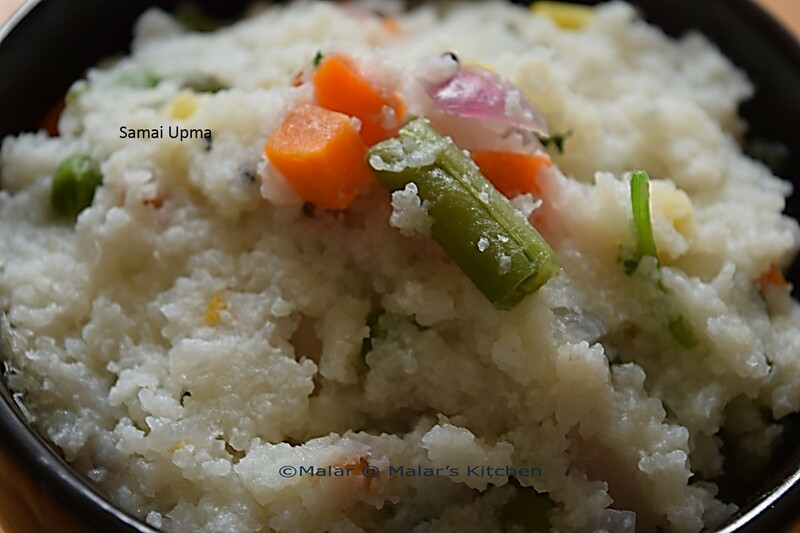 When Usha asked me to send some recipes, I planned to give her millet recipe. Do visit her page to find lovely recipes. A very dedicated and talented blogger for a long time now. You can check my recipe in her page too. 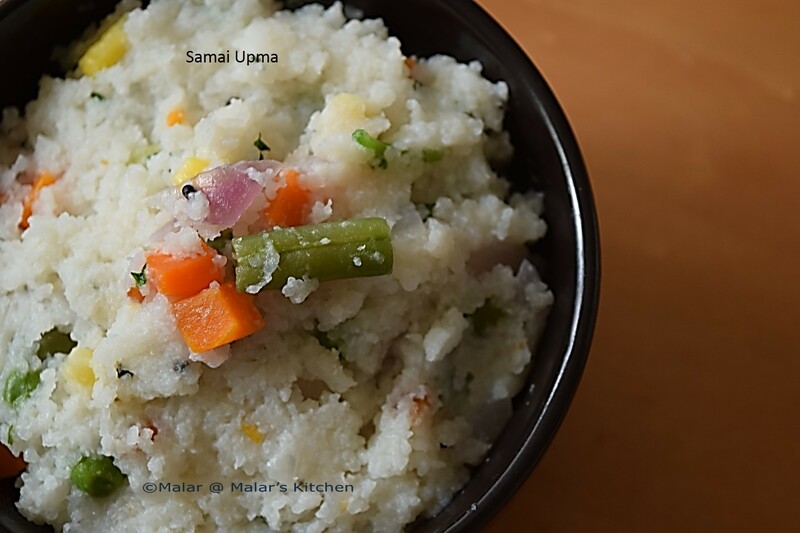 Millets have a lot of health benefits and they can be prepared similar to Rava. They are gluten free as well. Soak Samai/Little Millet in water for half an hour. Drain and set aside. Chop onions, green chilies.Heat oil in a pan, when hot add mustard seeds, urad dal, channa dal. When they turn golden brown, add curry leaves. Next add onion, green chili and saute till translucent. Now add the frozen veggies, saute till half done. Frozen cooks faster than fresh. Next add water and let it boil. Add salt to it.When it hot enough, add the drained samai and mix well. Cover with a lid and cook till soft and water gets dehydrated. Garnish with chopped cilantro leaves.